Karina's Kreations: Stampin'Up Petal Palette! I did my second facebook live video last night and I have to say it's harder than it looks. Who knew the hostess code would show reversed. LOL! If you want to see the video go to Karina's Kreations group facebook page. Send me a request and I will add you in. Anyway, if you're wanting to place an order today the hostess code is 4E76DUSG. On the video I showed how to do a partial die cutting technique to make this cute card. 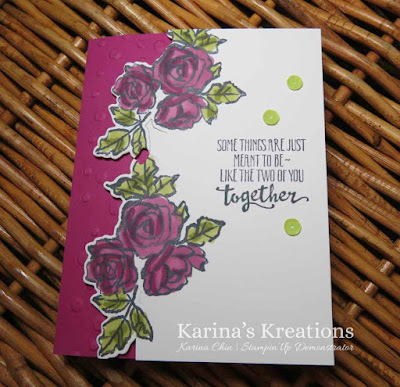 The card was colored with Stampin Blends which I highly recommend. Make you buy a Memento Black ink to use with the Blends.